Chemical cargoes may present a fire hazard which will be determined by the flashpoint, boiling point, flammability limits and auto-ignition temperature of the product. The marine pollution hazard will be dependent on several factors that include bioaccumulation and the attendant risk to aquatic life or human health. In addition, release into the marine environment may cause damage to living resources, hazard to human health and consequent reduction of amenities. The air pollution hazard posed by release into the atmosphere may categorised by the emergency exposure limit (EEL) of the substance. Watch standing personnel must ensure that no one who is smoking approaches or boards the vessel. Smoking on board must only take place in designated smoking areas. The company policy on drugs and alcohol must be strictly enforced. Permanent notices complying with international standards should be displayed in conspicuous spaces onboard, indicating prohibited smoking and use of naked lights areas. Enclosed areas that need to be ventilated prior to entering must also be marked. Local national or port regulations may require additional notices which the Master must ensure are complied with. Day and night signal for dangerous cargo as per local regulations and international code flag are to be displayed as appropriate. Have long term carcinogenic effects. Unplanned exposure of personnel to toxic or corrosive fumes or liquid should always be treated as an emergency and in serious cases the emergency team should be mobilised and the rescue plan put into operation. First Aid should be administered as documented in the MSDS, however, the Master must evaluate the seriousness of the exposure and, if in doubt, seek further advice regarding treatment. Officers must be trained in essential Firs Aid measures for the cargoes to be carried. In the event of a serious leakage resulting in large concentrations of fumes, consideration must be given to the organisation of alternative mustering points inside the accommodation in order for personnel to don the Escape Sets located at various work places and in cabins, prior to an orderly evacuation of the vessel, should this be necessary. Regular drills utilising this scenario should be practiced. Enclosed spaces like ballast tanks, cofferdams etc in the cargo area may contain flammable or toxic vapours or lack sufficient oxygen and must not be entered without permission from the Master and only if proper ventilation is provided. The Master is responsible for ensuring that the proper Enclosed Space Entry procedures are understood and adhered to. A list of spaces deemed to require Enclosed Space Entry procedures is to posted up for all crew to comply and all such spaces marked. On vessels capable of carrying toxic, flammable, or oxidising cargoes, special consideration should be given to the construction of the deck areas which may impede air flows from dissipating cargo vapours. There are many such areas on ships but commonly found in the vicinity of butterworth hatches, ullaging points and sampling points. They should be identified and risk assessments conducted to determine the appropriate risk control measures such as warning signs posted and personal gas meters to be worn. It is the responsibility of the Master and the person he delegate to be in charge of cargo operations, including bunkers, to know the applicable international and local pollution prevention regulations and to ensure that they are not violated. Exercises should be held to train personnel in accordance with the Vessel Response Plan and/or the Shipboard Oil Pollution Emergency Response Plan. The Master should ensure that both local and international regulations pertaining to the discharge of ballast water are complied with . Before any Tank Cleaning takes place, the pollution categories (X,Y,Z or OS) of the cargo residues in the tanks to be washed must be clearly established from one or more of the following sources: Shipping Document, IBC Code and Certificate of Fitness, If any ambiguity exists as to the Pollution Category the Master must seek advice from the Management Office prior to commencement of operations . All vessels certified to carry noxious liquid substances are required to have a Procedure and Arrangement Manual (P&A Manual) which is customised to the cargo handling and stowage systems of the individual vessel. Amongst sections concerning the vessel's equipment, arrangements, procedures and performance characteristics, the P & A manual lists those chemicals which the vessel is permitted to carry, relevant restrictions with respect to the pollution category, cargo arrangements together with arrangements for the discharge of residues and tank washing solutions to the sea and shore reception facilities. Any incident, whether accidental or intentional, concerning the discharge of Noxious Liquids into the sea, whether in harbour or at sea, must be reported to the proper authorities, a list of which can be found in the SOPEP manual. In cargo pumprooms, particular care must be taken to ensure that no leakage of cargo takes place through overboard discharge or sea suction valves when starting or running cargo pumps. Manual valves are to be chained/locked. These valves are to be air pressure tested regularly for integrity and a log entry made. Officers should refer to the ICS/OCIMF Publication “Prevention of Spillages through Cargo Pumproom Sea Valves”. Prior to any cargo operation taking place all deck scuppers are to be plugged and checked for tightness. Careful attention is to be given to keeping scuppers dry and clean. Mechanical type scupper closures are required to be used in USA ports and all ports. Manifold savealls are to be provided under each manifold connection. These are to be kept clean and dry wherever possible, with any cargo spillages being drained at the earliest opportunity. Operational contamination is to be prevented by use of portable collection drums during connection/disconnection. Following detail pages explain all liquid chemical hazards & precautionary measures while carrying at sea. The consequences of a chemical tanker ranging along a jetty or breaking away from a berth could be disastrous, especially during a cargo transfer involving multiple different chemicals. Correct and sufficient mooring is therefore of the utmost importance. During medium and high frequency radio transmissions significant energy is radiated, which can create a danger of incendive sparking by inducing an electrical potential in unearthed steelwork. Following reference publications provide useful guidance and international regulations for carrying hazardous chemicals at sea. 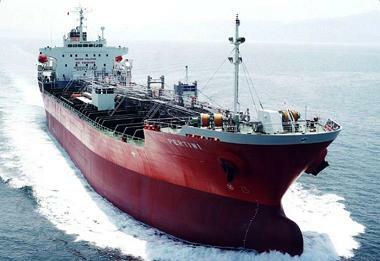 Copyright © 2011 Chemical Tanker Guide.com All rights reserved.